Copyright: The Loyal Edmonton Regiment Military Museum and CW Hill Photography. The Battle of Ortona by Gerald Trottier (1925-2004). 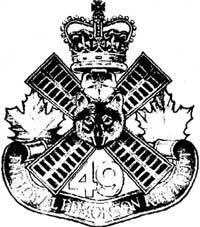 For more information about The Loyal Edmonton Regiment, go to The Loyal Edmonton Regiment. The Loyal Edmonton Regiment, or the 49th Battalion or The Edmonton Regiment as it was known at various times before 1943, earned an exemplary battle record over the course of two world wars. Since the Second World War, it has supported the regular force in NATO and UN operations, including Korea and Afghanistan. Follow the history of the regiment, including references to its predecessors, from the early 1900s to the present. Brief introductory remarks set the stage for the key periods of the regiment’s history that follow. Read about the militia in Canada and in Edmonton prior to the First World War and the birth of the 49th Battalion, under Lieutenant-Colonel Billy Griesbach, at the outbreak of the war. This chapter in the regiment’s history focuses on the 49th Battalion in the First World War, including the Ypres Salient, the Somme, Vimy Ridge, the pursuit to Mons, and two VCs. Follow the 1st Battalion of the Edmonton Regiment, which perpetuated the 49th Battalion, as it struggles through the 1920s and 30s. The history of The Loyal Edmonton Regiment in the Second World War includes training in England and fighting in Sicily, Italy, and North-Western Europe. Follow the story of The Loyal Edmonton Regiment from the end of the Second World War to the present, including Afghanistan. Learn about the Battle of Ortona painting by Gerald Trottier. The massive painting is on display at The Loyal Edmonton Regiment Military Museum.